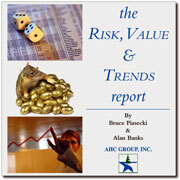 The AHC Group's Corporate Affiliates have been requesting private workshops focused on Risk Value and Trends. To satisfy this request we hosted a workshop last April that evaluated top rating companies. Our Senior Associate Alan Banks has composed a 65-page executive summary that reports on the findings from that exclusive workshop.